EMKA Electronic locking system for distributed corporate installations. Electronic locking is integrated into conventional mechanical lock components from the EMKA range – such as swing handles, rod systems and gaskets. These take care of the closure/sealing and protection of equipment housings against normal environmental factors, while the electronics make available a whole new level of operation for secure distributed systems – so flexible is the ELM Network that it may also be interfaced to proprietary LAN systems and building control systems via a linked server, thus offering the ability for operators to monitor and control the equipment installation from anywhere in the world. Traditional key systems simply don’t provide the control, feedback and logging facilities that the networked ELM can offer. This applies to: communication equipment, telephone control systems, company financial record systems leased or externally managed, e.g. by another division of the same company. The ELM networked system permits operation of the cabinet locking mechanism as well as environmental monitoring/control and 24 hour logging. In this way sensitive information networks may be physically protected from unauthorised access. ELM network security provides a secured space, especially where space is at a premium. Replacing, for example, the need for a secured room – ELM simply secures the cabinet with no need to physically see the cabinet to feel confident that it is secure. A typical ELM set up would include a communications module and a handle control module for basic control of the cabinet. A sensor module and sensors can also provide environmental monitoring and control, e.g. air conditioning/fans, thus improving efficiency. Further network connection to a laptop or server then enables full remote logging and manual system configuration for optimal security, e.g. access only by a certain individual at an agreed time on a particular day. 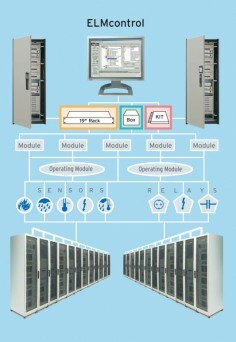 The ELM Network system, developed from many years experience in this field, features a conventional CAN-BUS using SNMP protocols, with each Bus linked to a maximum of 512 cabinet handles. The front-end windows environment is intuitive to anyone brought up on Microsoft products and provides a comprehensive set-up and automatic logging facility for the Bus modules. It facilitates definition of such parameters as: who has access, how access may be achieved, when access is permitted, what environmental sensor alarms are set, at what levels alarms are set and what controls are operated, e.g. fan/air-conditioning on/off. This is achieved by a hierarchy of master codes which may be established over up to 5 levels, with the validity of each code set by date, number of uses etc. There are over 4 billion possible codes and data transfer of sensitive information over the Bus is fully encrypted for complete security. Share the post "Electronic locking system for distributed corporate installations"